Whether you want to create a dream patio for partying or you want to add an extra dimension of style and class to the outside of your home, a perfectly planned and executed terrace will not only add aesthetic value to your home, but monetary value too! We have selected some of our favourite styles of terrace design, so take a look and see if you think any would fit your outdoor space perfectly. Who knows, you could be enjoying mojitos on the patio before next weekend! For a classic and elegant terrace design, you can't go wrong with some pale rustic stonework, rattan matting and fabulous furniture that looks relaxing! Throw in an oversized parasol and you've really got the makings of something special. We adore this space from TG Studio, as it has everything a classically beautiful terrace should and loses nothing, despite not being huge in size. This has clearly been created as a little private slice of heaven and we would love an invite! If you like the idea of your terrace design giving off a distinctive holiday vibe, then we totally understand where you are coming from! A little escape from the trials and tribulations of everyday life, we think a terrace at the bottom of the garden is a fantastic little tranquil addition. The use of a lot of greenery in this incarnation really brings warm sunny holidays to mind and for some year-round appeal, we think a couple of patio heaters would be a lovely add on. We can almost taste the piña colada already! A lot of houses in the Mediterranean have gorgeous terrace designs in full effect, but that shouldn't mean that you can't grab some of that rich, warm influence and use it yourself! While it might be true that there is better weather overseas, the British spirit is never trampled by a little bit of rain, so barbecues and garden parties continue regardless! Rustic stonework, fabulous furniture and bright blooms are all combining to give a real feel of warmer climates and if you can cook paella on the grill, so much the better! 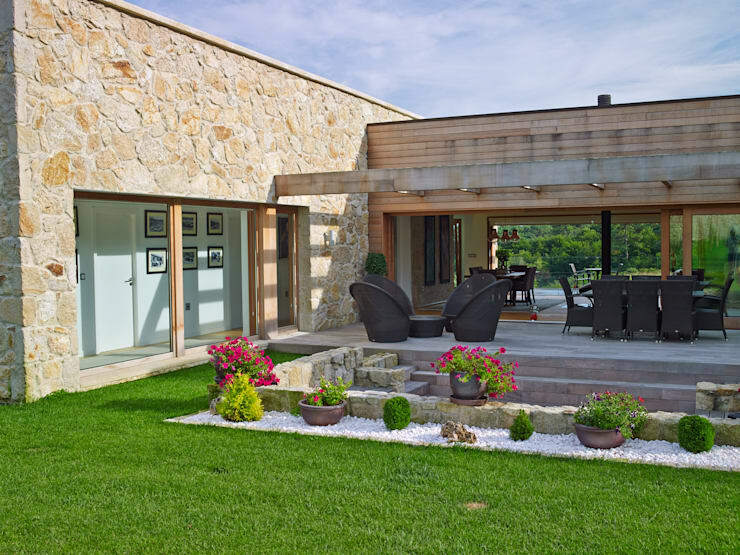 For something a little more ultra contemporary, your terrace design can be as unusual and stark as you like. If you don't believe us, just take a good look at this example! 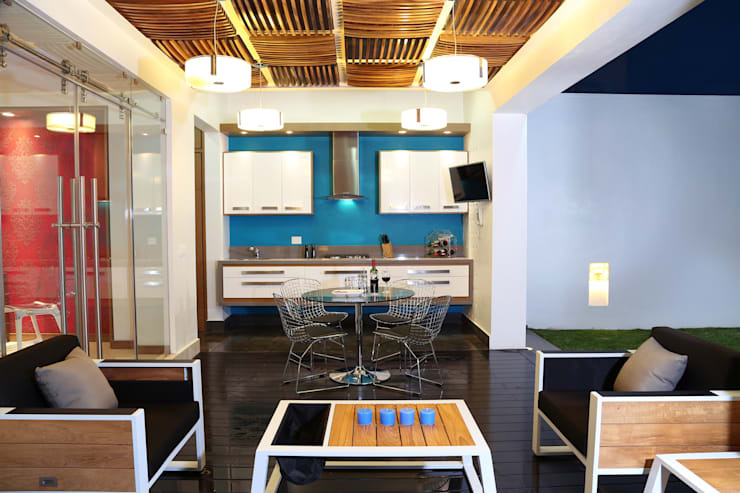 A bright wall, statement wooden ceiling tiles, wood flooring, arty furniture and amazing lighting have all come together to create a really modern feast for the senses. Stretching out into the garden, this terrace naturally encourages socialisation, so we can see a young couple or maybe a fun-loving singleton really embracing a design such as this one. Now this is the kind of terrace design that we love to see! We're not saying that we are ruled by our stomachs, but when there is a promise of delicious food being prepared, you won't find us dilly-dallying at the back! 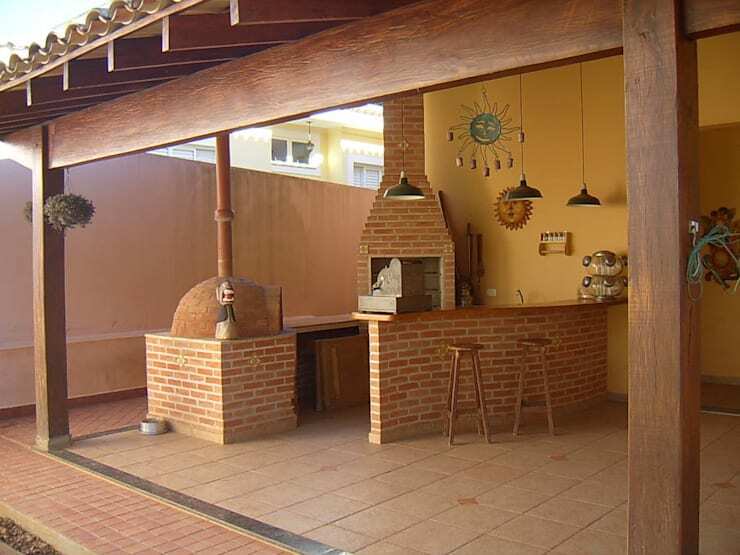 Obviously a terrace for a cooking fanatic, we love how bricks have been used to create an al fresco cooking and dining area and just take a look at that clay pizza oven! A lively, happy spot, we think this terrace would end up being used more than the main kitchen area, with everyone pitching in and lending a hand. Just lovely and so engaging! 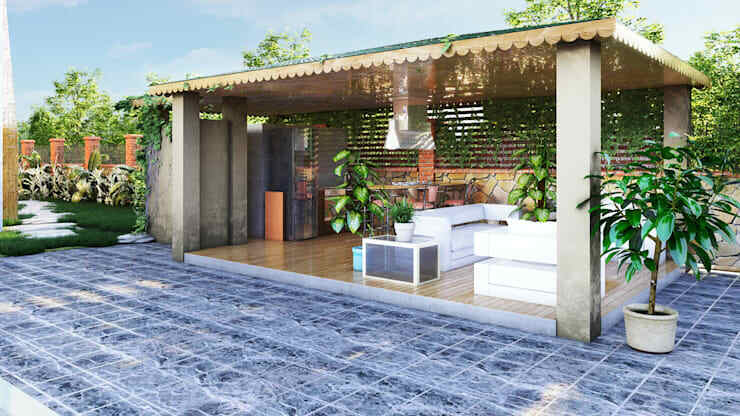 When the idea of a fabulous patio area appeals to you, but you are worried about the frequently inclement UK weather, there is only one solution; build something with a roof! We can just tell that this amazing area is party central and the terrace design process must have been very prescriptive; make al fresco dining possible all year round. With gorgeous blooms nearby, the effect of being outdoors is tangible, yet the convenience of the roof makes sure that nothing will rain on your parade. Perfection! For more terrace design inspiration, take a look at this Ideabook: Creating Your Ideal Barbecue Patio. 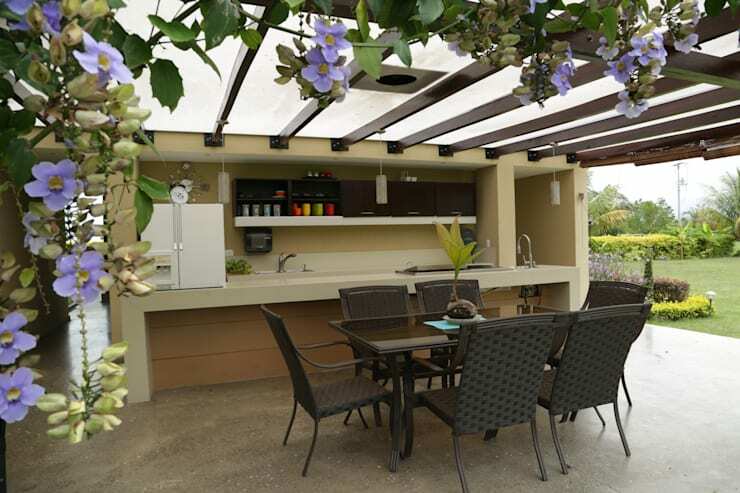 With your perfect terrace designed, you'll need to think carefully about the grill! Would you love a stylish terrace for your home? Which design would you opt for? Let us know!